Cross the centerline in an intersection. Check your blind spots by looking over your left or right shoulder. Before changing lanes, check for drivers trying to pass you who may be trying to enter the same lane as you. Look over your shoulder to check your blind spot. You should never attempt to pass or otherwise change lanes in an intersection. Watch for people crossing your path. 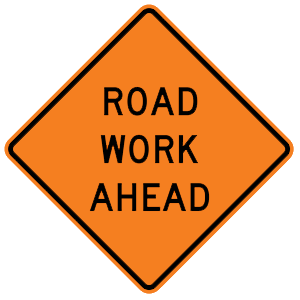 This orange warning sign tells drivers that an area of roadwork is upcoming. When traveling through a work zone, stay alert for temporary traffic control devices.